The roles of extracellular purines and pyrimidines in cellularhomeostasis and disease etiology have come to be understoodgradually over the past 40 years. However, due to the recentcloning and expression of receptors for ATP and adenosine, novelcompounds have been developed with unique therapeutic potential forthe treatment of thrombosis, stroke, epilepsy, chronic pain,immunological disorders, and cancer. As a result, the study ofadenosine- and ATP-mediated responses in cellular regulation isentering a phase of opportunity and development unmatched since thedays of serotonin receptor research in the 1970s. The only definitive book on the topic, Purinergic Approaches inExperimental Therapeutics covers all of the major therapeuticapplications of purinergic receptors and reflects the very latestdevelopments in this new area of therapeutic research. Twenty-eightchapters, authored by an international group of contributors whoare the leading authorities in the field, provide details onmolecular pharmacology; medicinal chemistry; and therapeuticimplications, including cardiology, metabolism, immunology,neurology, and cancer. For researchers in pharmacology, physiology, molecular biology, andmedicinal chemistry, Purinergic Approaches in ExperimentalTherapeutics heralds an exciting new era in the understanding ofpurinergic neurotransmission and the development of noveltherapeutic modalities. 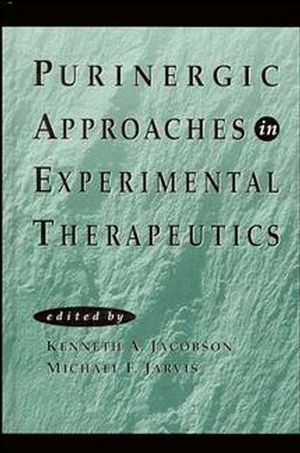 Kenneth A. Jacobson and Michael F. Jarvis are the authors of Purinergic Approaches in Experimental Therapeutics, published by Wiley. Purinergic Neurotransmission and Neuromodulation: A HistoricalPerspective (M. Williams & G. Burnstock). Adenosine Receptor Subtypes: New Insights From Cloning andFunctional Studies (G. Stiles). Development of Selective Purinoceptor Agonists and Antagonists (K.Jacobson & A. van Rhee). Cardiac Electrophysiology of Adenosine: Antiarrhythmic andProarrhythmic Actions (L. Belardinelli, et al.). The Role of Adenosine in Asthma (M. Jacobson and T. Bai). Psychomotor Aspects of Adenosine Receptor Activation (M.Jarvis). Adenosine Effects in Sleep Apnea (D. Carley & M.Radulovacki). ATP in the Treatment of Cancer (E. Rapaport).